Europeans, like most other inhabitants of the planet, are currently facing the crisis of ’politics as we know it’ – a state of “interregnum”, as the Italian philosopher Antonio Gramsci described a time in which the old is already dead or dying, but the new has not yet been born. 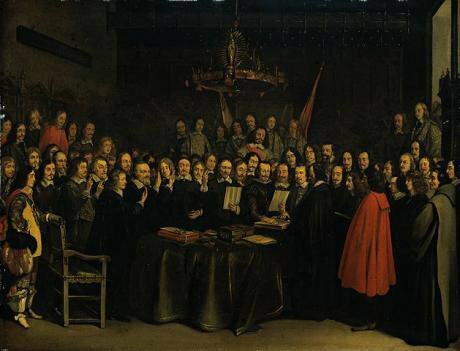 Ratification of the Peace of Münster between Spain and the Dutch Republic in the town hall of Münster, 15 May 1648 by Gerard ter Bosch. Wikimedia Commons/Public domain. In studying the set of fateful departures occurring in Europe three centuries ago, the eminent historian Reinhart Koselleck introduced a metaphor of climbing up to a yet unmapped and un-reached mountain pass. But as you try to reach that pass far up, you can only guess what sort of sight will open to you once (if) you finally arrive there. At present, all settlements arrived at en route as we confront successive challenges and disagreements exude an air of temporality. They seem and indeed all too often prove to be only ’until further notice’, with a cancellation clause built in - just as our divisions and coalitions are ad hoc, frail and half-hearted. Worse still, we find it difficult to make a sensible story out of our past undertakings - our agenda is constantly a-changing and our attention abominably shifty for such a story to be established. A few weeks ago, on the occasion of launching a new UK ITV series on current affairs, the highly respected Radio Times weekly sorrowfully opined that, "A new monthly strand looking at international news in greater depth has to be a good thing. The trouble is, the news agenda moves fast, and when headlines are dominated by Ukraine, Syria and China, it looks like a missed opportunity to have your first edition focus on Rwanda, Colorado and Norway...". All the same, in Le Monde for February 2, Nicolas Truong, referring to the views expressed for some time by Daniel Cohn-Bendit and Alain Finkielkraut, presented two opposite scenarios for the future of our, the Europeans', cohabitation; the only two scenarios to choose from as no other seemed to him realistic or indeed conceivable. Cohn-Bendit, in cooperation with Guy Verhofstadt published a manifesto, "Debout Europe!" in which he promotes the fast track out of and beyond the myth of the nation-state’s territorial sovereignty and towards European Federation, stamped and sealed with a ’European identity’ yet to be patiently and consistently constructed. Finkielkraut is no less firmly convinced that the future of Europe is in its unity - but believes that it needs to be a unity (cohabitation? cooperation? solidarity?) of national identities. Finkielkraut recalls Milan Kundera's insistence on Europe being embodied in its accomplishments, landscapes, cities and monuments; Cohn-Bendit invokes the authority of Jürgen Habermas, Hannah Arendt and Ulrich Beck, united as they are in their opposition to nationalism. Beyond doubt, the present institutional structure of the European Union, incoherent as it is, with the policy without politics conducted in Brussels set against the politics without policy for which the European Council is notorious and the parliament with a lot of talking and little power - a structure unsustainable in a long run and crying out for a thorough rehashing - feeds simultaneously both above mentioned tendencies. Eighty years ago Edmund Husserl warned - so Nicolas Truong reminds us - that "the gravest danger menacing Europe is its lassitude". Time marches on, but warnings do not age. Time to dismiss them as outdated has not yet arrived. Neither is it likely to arrive in the foreseeable future. The modern chapter of Europe’s attempts at unity, short of the unity of peaceful coexistence, came after the most successful thus far and most durable accomplishment of the Roman Empire - and after the posthumous attempt of its reincarnation in the phantom of a Holy Roman Empire bit the dust on the post-Reformation religious battlefields. It started in 1555 in a German town of Augsburg, to which the ruling dynasties of the parts of Europe most devastated by warring religious factions sent their plenipotentiaries to discuss and hopefully agree a formula of armistice capable of stopping the first (though as it was to transpire, by no means the last) all-out fratricidal war of the Europeans. The formula – cuius regio, eius religio – was coined and agreed, but the armistice needed almost a century more of killings, burnings, destruction and epidemics to be accepted, embraced and put into practice; till 1648, when spokesmen for the main adversaries sat once more around the negotiating table, this time in Münster and Osnabrück, to arrive at an agreement recorded in history as the ’Westphalian settlement’. Once incorporated into the practice of governance, the formula of Westphalian settlement proved to be uniquely suitable for preparing the stage for the nation-building chapter in European history: it took but a substitution of “natio” for “religio” (as a matter of fact, a purely terminological change, not a substantive operation) to deploy it as the universal ordering principle in the lengthy and thorny process of the Europe-inspired and by-Europe’s-power-assisted transformation of the world, divided between the scions of divinely annointed dynasties into a world sliced into states resting their legitimation and so also their claim to the obedience of their subjects (that is, the population inside their boundaries integrated by the retrospectively postulated common origin and now also by the state-assured commonality of the future, into a nation) on ’national interest’. The snag is, that it is also counterfactual and increasingly so - its premises being delusionary, its postulates unrealistic and its pragmatic recommendations impossible to fulfil. In the course of the last half century the processes of deregulation originated, promoted and supervised by state governments joining voluntarily or pushed to join the so-called ’neo-liberal revolution’, have resulted in the growing separation and rising probability of divorce between power (that is, the capacity of having things done) and politics (that is, the ability to decide, which things need and ought to be done). Many of the powers previously contained inside the borders of the nation-state evaporated and flew into the no-man’s land of the “space of flows” (as Manuel Castells dubbed the politics-free expanses), whereas politics has remained as before, territorially fixed and constrained. That process has acquired all the markings of a self-propelling and self-intensifying tendency. Seriously drained of powers and continuing to weaken, state governments are compelled to cede one by one the functions once considered a natural and inalienable monopoly of the political organs of the state into the care of already ’deregulated’ market forces, evicting them thereby from the realm of political responsibility and supervision. This results in the rapid fall of popular trust in the governments’ ability to deal effectively with the threats to the existential condition of their citizens. Citizens believe less and less that governments are capable of delivering on their promises. They are not entirely wrong. One tacit yet crucial assumption underlying trust in the efficacy of parliamentary democracy is that citizens decide in elections who will rule the country for the next few years and whose policies the elected government will attempt to implement. The recent collapse of the credit-grounded economy threw that state of affairs into spectacular relief. 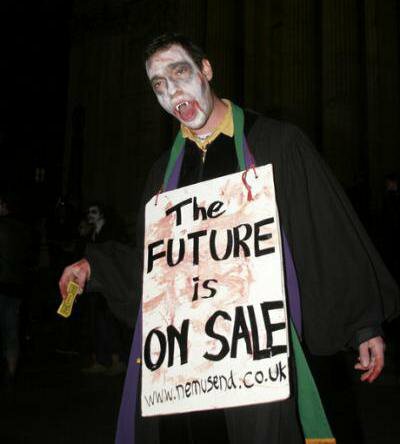 Anti-capitalist protesters held a Halloween celebration outside St. Paul's Cathedral. Demotix/Bimal Sharma. All rights reserved.As John Gray, one of the most insightful analysts of the roots of the present-day world-wide instability, observes in the preface to the new (2009) edition of his False Dawn: The Delusions of Global Capitalism, when asking why the recent economic collapse failed to increase international cooperation but instead released centrifugal pressures - “governments are among the casualties of the crisis, and the logic of each of them acting to protect its citizens is greater insecurity for all”. And this is because “the worst threats to humankind are global in nature”, while “there is no prospect of any effective global governance to deal with them”. Indeed, our problems are globally produced, whereas the instruments of political action bequeathed by nation-states’ builders were cut to the measure of services territorial nation-states required; they prove therefore singularly unfit when it comes to handling global challenges. For us, continuing to live in the shadow of the pretence of the state's territorial sovereignty, they are all the same the sole instruments we can thus far think of and are inclined to turn to in a moment of crisis, despite their jarring inadequacy in securing a territorial sovereignty, the sine qua non condition of that settlement’s practical viability. One widely observed and predictable result is the frustration caused that is bound only to be beefed up by the mutual inadequacy of means to ends. To put it in a nutshell: our present crisis is first and foremost a crisis of agency – though in the last account it is a crisis of territorial sovereignty. Each formally sovereign territorial unit might serve nowadays as a dumping ground for problems originated far beyond the reach of its instruments of political control - and there is pretty little it can do to stem this, let alone pre-empt it, considering the volume of power left at its disposal. Some formally sovereign units, indeed a growing number, are demoted in practice to the rank of local police precincts struggling to secure the modicum of law and order necessary for the traffic whose comings and goings they neither intend nor are able to control. However big the distance is between sovereignty de jure and their sovereignty de facto, all of them however are bound to seek local solutions to globally generated problems – a task far transcending the capacity of all except a handful of the richest and most resourceful among them. Europeans, like most other inhabitants of the planet, are currently facing the crisis of “politics as we know it”, while being moved by the propulsion to find or invent local solutions to global challenges. Europeans, like most other inhabitants of the planet, find that the currently deployed ways of doing things don’t work properly, whereas alternative and effective ways of having things done are as yet nowhere in sight (a situation described by the great Italian philosopher Antonio Gramsci as a state of “interregnum” – that is a time in which the old is already dead or dying but the new has not yet been born). Their governments, like so many others outside Europe, are in a ’double bind’. Unlike however in the case of most other inhabitants of the planet, the world of Europeans is a three-, not a two-storey edifice. Between the global powers and national politics, there is the European Union. That intrusion of a ’middling’ link in the chain of dependency muddies the otherwise clear ’us’-and-’them’-style division. Which side is the European Union on? Is it a part of ’our’ (autonomous) politics, or of ’their’(heteronymous) power? Viewed from one side, that Union is seen as a protective shield sheltering the aggregate of individual states, many of them much too wan and tiny to dream of meeting the stern demands of sovereign existence, from the worst excesses of the unbridled and unscrupulous global powers. Viewed from the other side, that Union is seen as a kind of fifth column of the selfsame global powers, a satrap of foreign invaders, an ’enemy within’ – and all in all a vanguard of forces conspiring to erode and ultimately to render null and void both the nation’s and the state’s chances of sovereignty: a perception as unscrupulously as duplicitously exploited by the siren voices of the neo-nationalists offering the phantom of national/territorial sovereignty as a cure for the ills of which their reality is a cause. Europe, just like the rest of the planet, is nowadays a dumping ground for the globally generated problems and challenges. But unlike that rest of the planet and almost uniquely, the European Union is also a laboratory in which the ways to confront those challenges and tackle those problems are daily designed, debated and tested in practice. I would go as far as to suggest that this is one (perhaps even the sole) factor that makes Europe, its dowry and contribution to world affairs, exclusively significant for the future of a planet faced with the prospect of a second seminal transformation in the modern history of human cohabitation - of the crushingly toilsome leap, this time, from the ’imagined totalities’ of nations-states to the ’imagined totality’ of humankind. In that process, still in its initial and precocious stage, yet bound to proceed if the planet and its inhabitants are to survive, the European Union stands a chance of performing the combined/blended tasks of a reconnaissance sally, a mid-station and an advanced outpost. A great chance, yet not an easy tasks, and anything but guaranteed to succeed; as well as bound to confront most Europeans, hoi polloi and their elected leaders alike, with a lot of friction between conflicting priorities and hard choices. Perhaps the idea of Europe was and remains a utopia... But it has been and remains an active utopia, struggling to coalesce and consolidate the otherwise disconnected, multidirectional actions. How active that utopia will ultimately turn out to be, will depend ultimately on its actors.